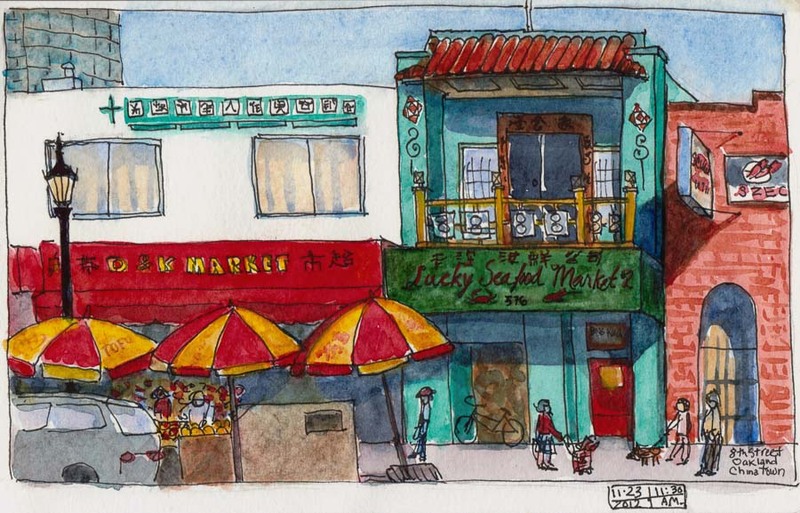 Early on the morning after Thanksgiving our Urban Sketchers group went to Oakland’s Chinatown for some sketching. It was business as usual in the busy produce markets, herb shops, meat and seafood stalls, and Chinese restaurants, with no sign of Black Friday. I found a spot to sit in front of a bank and had fun drawing all the details in the architecture. I started in pencil because the scene seemed so complicated. It’s easier to get it “right” with an eraser but it takes so much longer to draw it twice, in pencil and then in ink. I had to add the watercolor at home from a photo because by the time I chose my spot and did the drawing, it was time to meetup with the group. While I drew, local people stopped to watch and give me encouragement, whether in excellent or broken English. My favorite was the plump, elderly lady who said something in Chinese, grinned, and gave me a big thumbs up. The amazing thing about sketching in public is that no matter how good or bad you’re doing, people always say nice, encouraging things. Since many of us were there, we took photos for our group blog. I used the timer on my camera, setting it on the edge of a defunct fountain in the center of this plaza. I didn’t realize I was including the lady on the end. She must have been really tired as she nodded off and slept through our photo session. The photo we ultimately used on the USK blog masthead here was kindly taken by a guy who watched me repeatedly duck under the yellow warning tape around the fountain, set up the camera, and dash back to sit with my friends. What a splendid photo with the sleepy woman on the end. What fun your group must have had in your sketching tours. Happy Christmas and keep up the lovely postings. Nice sketch and a fun photo. Great sketch, Jana. It always amazes me how Chinatowns look the same no matter where you live. I like the red and yellow umbrellas in the front and the people with the dogs. I laughed out loud when I took a closer look at the photo (I first received this on my phone and the photo was small) and I saw the woman asleep at the end of the bench. This looks such a great sketching group to be a part of. It takes courage to sketch whilst somebody watches you…..I try to sit so nobody can get to me easily. So good to have found your blog. many regards and Happy Christmas to you.